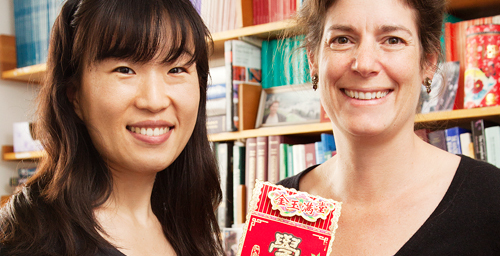 Psychology professor Eva Pomerantz, right, student Lili Qin and their colleagues found that American children's sense of obligation to their parents and desire to please them by doing well in school declined in the seventh and eighth grades, while Chinese students of the same age generally maintained their feelings of obligation and increased their motivation to please their parents with their academic achievements. Qin holds a Chinese greeting card offering the recipient good luck with academics in the new year. CHAMPAIGN, lll. - According to a new study, American, but not Chinese, children's sense of responsibility to their parents tends to decline in the seventh and eighth grades, a trend that coincides with declines in their academic performance. The study, in the journal Child Development, found no difference between American and Chinese students' feelings of responsibility to their parents at the beginning of the seventh grade. The American children's sense of obligation to their parents and desire to please them by doing well in school declined over the next two years, however, while the Chinese students generally maintained their feelings of obligation and increased their motivation to please their parents with their academic achievements. "These different trends are notable because when children were able to maintain a sense of responsibility to their parents, they were not only more motivated and engaged in school, but also earned better grades over time," said University of Illinois psychology professor Eva Pomerantz, who led the study. "Chinese children's maintenance of a sense of responsibility to their parents may protect them against the decline so common among American middle schoolers in their engagement and achievement in school." The study, which also included researchers at the Chinese University of Hong Kong and Beijing Normal University, involved 825 students in suburban Chicago and suburban Beijing. In four sets of surveys given over two years beginning in the seventh grade, researchers asked the students about their attitudes toward parents and school. The researchers also tracked the students' grades. "These findings are important because they suggest that one reason American children become less engaged in school during adolescence is that they do not feel a sense of commitment to their families," Pomerantz said. "Because of the benefits for children academically, we need to identify how parents can foster a sense of responsibility in children." Editor's note: To contact Eva Pomerantz, call: 217- 244-2538; e-mail: pomerntz@illinois.edu. The paper, “Changes in Early Adolescents’ Sense of Responsibility to Their Parents in the United States and China: Implications for Their Academic Functioning,” is available in pdf.